Nothing sends a stronger message than a written message from an eyewitness of an event, freezing the moment in time. Pliny the Younger did just that with two letters documenting the eruption of Mt. Vesuvius in 79 AD. Typically, archaeologists excavate tombs of the important people, rulers with god-like status, and all the wealth in the world (literally). Cities, more often than not, are the remains of ruins already destroyed by conquering invaders or ravaged by erosion for eons of time. Human remains are limited to piles of bones at the bottom of graves or in sarcophaguses pillaged by grave robbers thousands of years prior to the excavation. Once in a great while, a find is made, like Pompeii, where the city is preserved, buried beneath twenty feet of ash in a matter of days, and then forgotten for 1500 years. Sealed in its tomb, it was undisturbed until 1599 by an Italian architect, who after uncovering a fresco, decided to rebury it, because of its lewd offensive nature. 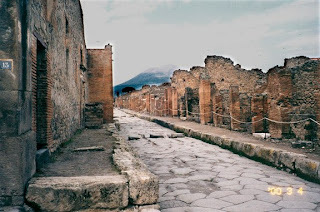 In 1748 during the excavation of Pompeii’s sister city, Herculaneum , Pompeii was officially rediscovered. Because it was sealed so completely, beautiful frescos, statues, villas, and temples were preserved in remarkable condition. 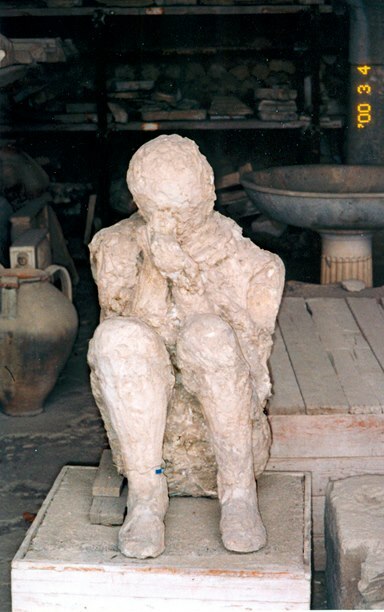 Vesuvius was not selective in who it buried, so common people, wealthy merchants, and slaves all died together. Many left impressions, hollow cavities under the ash from which grotesque, plaster replicas could be cast, revealing their horrific final moments. 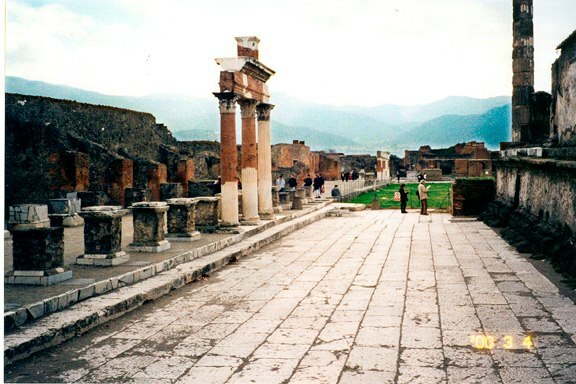 Pompeii was a thriving seaport on the Adriatic that funneled goods into Rome. Of course today the ruins are seven miles from the sea, which has receded. I remember our tour guide claiming the city had a population exceeding 40,000. That would be twice the size of renaissance Venice. You would wonder how a city of this size could be lost so close to the modern era and I have never heard a reasonable explanation. Particularly with an eyewitness account of the disaster surviving in the writings of Tacitus. I can only suppose that scholars, reading the letters, assumed that the city existed, but was hopelessly lost to the world. At the time, a magistrate, Pliny the Younger, watched the whole thing unfold from his villa at Misenum, a village across the Bay of Naples from Pompeii. He was several miles away, but watched the eruption with his uncle Pliny the Elder. His uncle mounted an expedition into the city to rescue the wife of a friend and died heroically overcome by smoke, fumes, and exertion. 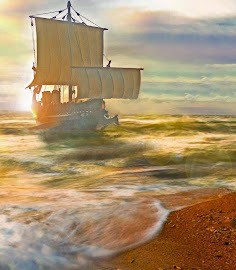 Evidently, slaves and companions made it back to Misenum because Pliny the Younger recorded the events in two letters that survive to this day. He sent them to his friend the famous historian, Tacitus. The letters are short, but the descriptions are chilling. Then the flames and smell of sulphur which gave warning of the approaching fire drove the others to take flight and roused him to stand up. He stood leaning on two slaves and then suddenly collapsed, I imagine because the dense, fumes choked his breathing by blocking his windpipe which was constitutionally weak and narrow and often inflamed. When daylight returned on the 26th - two days after the last day he had been seen - his body was found intact and uninjured, still fully clothed and looking more like sleep than death." Passages from his second letter following up on the escape of himself and his mother. "...Ashes were already falling, not as yet very thickly. I looked round: a dense black cloud was coming up behind us, spreading over the earth like a flood. 'Let us leave the road while we can still see,'I said,'or we shall be knocked down and trampled underfoot in the dark by the crowd behind. 'We had scarcely sat down to rest when darkness fell, not the dark of a moonless or cloudy night, but as if the lamp had been put out in a closed room. Great article. I thoroughly enjoyed my tour through Pompeii, however I learned that there are several routes and we were only on one of them. Certainly makes me want to go back. Thank you so much for sharing these letters. I can't imagine what those poor souls went through. It's amazing that these letters survived.